Application Fee / Intimation Charges:Candidates have to pay of Rs. 600/- for UR & Other and Rs. 100/- for SC/ST/PWD candidates through online. 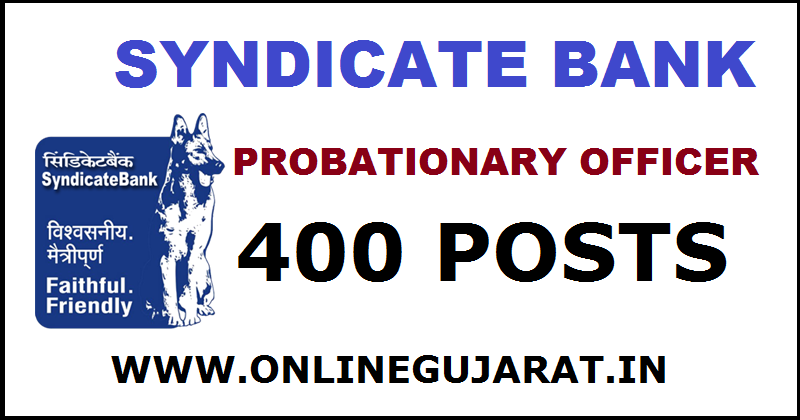 Selection process: Candidates shall be selected by Syndicate Bank through a selection process consisting of an (open) online test conducted by IBPS followed by Interview and/or Group Discussion. The selection process aims at getting applicants who are likely to succeed at various roles in the Bank. The endeavor is to select people who are bright, dedicated, have good communication skills (both oral and written), can work effectively in teams, are passionate about their career goals and who display integrity and a positive attitude. How to apply: Candidates are required to apply only 'ONLINE'. Any other form of application/incomplete application shall be rejected.